In a prairie-style house near a park with a pool our friends planted a garden along a fence and set a sand box by the patio. Rose of Sharon climbed a shady maple by the garage. Inside, a new open kitchen revved with Wolf, Kohler and Cuisinart. Mission oak chairs surrounded an antique cherry table laid with art deco banded plates atop silver chargers. Our friends’ summer supper redolent of a Tuscan journey featured Midwestern golden corn. As I rolled fettuccine laced with kernels on my fork, I recalled the harvest rite of cutting corn. Fresh from the garden, burlap bags of roasting ears waited by the back steps. First we shucked, then we blanched, then we cut, as we sat around a big tub under the kitchen light. To cut corn the old way, hold one end of a cob and rest the other end on a sheet pan or board. Use a very sharp knife to slice off the top section of kernels leaving a quarter-inch of inner corn on the cob; continue all the way around the cob. Then firmly scrape the cob with the kinfe, extracting the creamy centers, leaving behind the coarse nibs and tough hulls. Before the season slips away, apply this old Amish corn cutting to the popular corn pesto recipe with whole grain fettuccini, roasted walnuts and a special thanks to those who pointed the way. Gather all ingredients; dice bacon, grate cheese, chop garlic, etc. Bring a large pot of salted water to the boil. Blanch corn 2 minutes; remove. Blanch whole zucchini 2 minutes; remove. Keep the pot of water ready. Cut corn as described above: use a sharp, small knife to cut through the top half of the kernels. Scrape the cob, thoroughly extracting all the sweet corn “cream.” Separate the creamed corn and the top kernels. Set aside 1 ½ cups corn kernels and combine remainder with corn cream. Thinly slice zucchini. In a 3-quart cast iron or shallow stainless pot, sauté bacon until fat is rendered and bacon is golden, crisp, but not hard. Remove bacon to a side plate or drain on paper towel. Leave 1 tablespoon bacon dripping in the pot and sauté garlic until fragrant. Add red pepper, corn cream mixture, olive oil and half the Parmesan cheese. Simmer briefly. Meanwhile bring the pot of water back to the boil and cook the fettuccine 2-3 minutes for fresh pasta or follow package directions for dry pasta. When pasta is almost done, add a ladle or two of pasta water to hot corn cream mixture and whiz it to a smooth sauce, using a hand-held immersion blender. Add reserved corn kernels. Seconds before the pasta is done, add the whole basil leaves and the sliced zucchini (to heat zucchini and wilt basil). Pour pasta into a colander to drain, reserving a cup of hot pasta water if needed to thin sauce. Combine hot pasta with warm corn sauce, thining with pasta water to keep sauce loose and creamy. Divide among four shallow bowls. 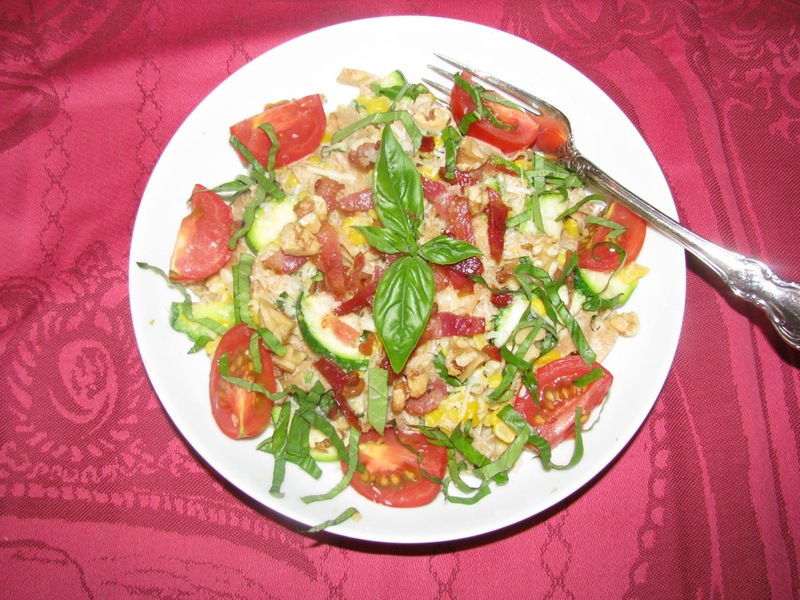 Top each serving with grated Parmesan, bacon, broken roasted walnut pieces, and shredded basil. Garnish with halved or quartered cherry tomatoes. *To make 12 oz. homemade whole wheat fresh pasta, use 4 oz. whole wheat flour, 4 oz. semolina flour, 2 eggs, pinch salt and a little water to make a stiff dough. You are currently browsing the Mary Jo's Kitchen blog archives for August, 2012.